Lynn Boorady, associate professor and chair of the Fashion and Textile Technology Department, wants to go beyond teaching students how to design, create, and sell beautiful clothes. She also wants them to understand how clothing affects the planet. When you consider the fashion industry is built upon the premise of newness and encourages consumers to regularly toss out what is outdated, millions of pounds of clothing end up in landfills each year. Boorady literally went around the world to work toward a solution to this ecological dilemma. 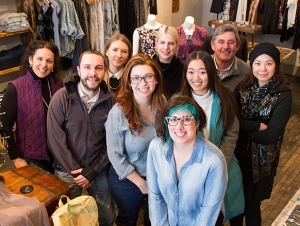 She and senior fashion merchandising major Jennifer Steinhorst traveled to Manchester, England; Melbourne, Australia; and Beijing, China; for three weeks in March as part of Connect, a global collaborative effort to bring awareness to fashion students about sustainability and innovation in the field. The pair connected with one fashion professor and one student from Manchester Metropolitan University (MMU), Beijing Institute of Fashion Technology, and the Royal Melbourne Institute of Technology. MMU funded the entire trip. The group toured manufacturing plants, visited retailers, and participated in forums discussing ways to save natural resources while making clothes. The trip kicked off in Buffalo on March 6 when the School of the Professions hosted the international participants on campus for a public lecture and lunch. Boorady pointed out that Steinhorst, who was chosen by the FTT faculty to participate in the trip from an essay contest and interview, is now that much more attractive to employers. In essence, Connect members are questioning the sustainability practices of the fashion industry, much as environmentalists and others investigated where our food comes from and what chemicals go into much of what we consume more than a decade ago. As a result, grocery shoppers are now shifting toward more locally grown and organic meat, produce, and dairy. However, it took years to change perceptions, and they still are evolving. Likewise, in the fashion industry, there is resistance to change. Part of this stems from the current “fast fashion” movement in which designers make very cheap, flimsy clothing that may be stylish but do not last. “It’s like we’re in a race to the bottom—searching for the cheapest clothes for consumers who want variety in clothing,” said Boorady. During this trip, the participants shared ideas on increasing recycling, using more eco-friendly fabrics and dyes, and encouraging designers to make longer-lasting clothes. Learn more about the Connect project and read Steinhorst’s blog posts from the trip.